Someone in the Regime is recycling the minds of decommissioned cyborgs, turning them into weapons even more horrific than they were before. To stop it, Pax will need the help of telepathic Vitharan ambassador - and part time spy - Nahleene Veila’ana, a woman whose motivations are as opaque as her past. Since his escape from his military masters, Pax has operated using a strict self-imposed code based on logic. He never expected to experience emotion again - not even somebody else’s emotions. I really enjoyed this book and had listened to it within a day. This is the third book in the love and war book and I have listened and enjoyed the previous two books and this was no exception. I love the way each warrior is damaged in some way and is ready to die for his or her cause but with all the mayhem going on they still find love and a reason to live. This book is Pax's turn and being the only cyborg in the group it was fun to find out how he was going to fall in love (especially with not being able to feel) as well as take down the regime. I love all the characters from the grumpy to the brave and like the way that they are all individuals but have important parts to play within the team and there ever lasting friendships. May good continue to triumphant over evil. Gwendolyn is the narrator for all the books in this series and I hope she continues as I can't imagine a better person to bring these characters to life. I loved this addition to the Love and War series. I absolutely love all the damaged characters in this series and how they fight against the regime that destroyed their lives, families, and homes. It's wonderful how they help and heal each other in the midst of tragedy and struggle. I was impressed and intrigued by the way Ms. Steffan was able to make a cyborg one of the main characters here and develop his ability to experience emotions through a telepath, even though his own emotion centers had long since been destroyed. She made him relatable and believable. I felt sorry for his past loss of self due to a conversion process he obviously wasn't fully informed of when he agreed to be part of the project. I'm not usually a Sci-fi fan, but this series is as driven by the people, emotions, and clever intigues, as the technology and science. I love every book, and I eagerly await more of the story. Ms. Druyor's narration is always fantastic. She is good with male and female (and cyborg) voices, and she is a master at expressing the emotions of the characters. Her tone, pacing, and delivery are always spot on. I received a free copy of this audiobook from the author. This is my honest, voluntary review. Such a wonderfully fantastic read! Loved loved it! Very interesting and devouring. A perfect story. A wonderful read. Great characters. Well-written story that will take you on a journey leaving you breathless and hungry for more! The narrator did a wonderful job of giving life to this story! 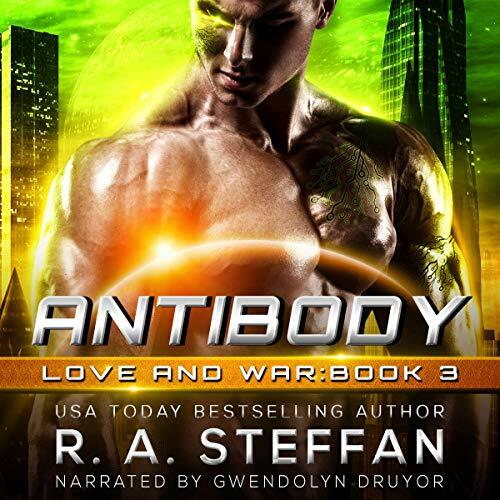 Antibody is the third in the Love and War series, but the author gives the right amount of background and world building, so that this book could be read as a standalone. However, I highly recommend the first two books in the series, and this book is even better as part of the series. Love and War brings back the Shadow Wing crew, a group of rogue space dwellers fighting against evil forces trying to wipe out humans from the solar system. This book features Pax, a cyborg programmed to only obey orders and kill as directed. However, unlike his fellow cyborgs, Pax developed a free will and fled his creators when they ordered him to self-destruct. Pax joined the Shadow Wing group, and, although he has found friendship with them, he still feels alone in a world predisposed to fear him for his lack of feelings. Introduced in book two, when she comes to the aid of the Shadow Wing, Nahleene Veila’ana is a Vithian ambassador, part-time spy and secret telepath. It is this final skill that proves the saving of Pax in so many ways. While working together on a secret mission to destroy an army of essentially zombie cyborgs, Pax and Nahleene become very close physically and emotionally. By touching Nahleene, Pax can sense her emotions, and it is the closest he has come to feeling since being converted into a cyborg. Conversely, Nahleene finds Pax's lack of emotions soothing to her heightened senses. In other words, these two are exactly what the other needs. Of course, the author throws in some obstacles to them reaching their HEA (miscommunications, multiple life threatening missions, drama among the crew, etc. ), but I certainly enjoyed the ride to them getting there. Gwendolyn Druyor's narration is sublime. 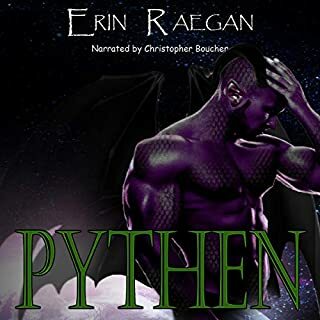 She narrates all of the RA Steffan novels, and I can't imagine a better choice for these action-packed paranormal romances. She differentiates beautifully between the characters, she handles accents with great skill, and her emotion level is always perfect for the mood of the scene. Once again, a reader can't go wrong with the team of Steffan and Druyor. Really good series. Not to fast paced in the background story. A lot of instalove in this series. I am enjoying the time the narrator is taking for/with the voices. I was given this free review copy audiobook at my request and have voluntarily left this review. I loved it! I read it as a stand alone and it was a great story. A nice 8 hour escape from reality. Great narration too, that was pleasant to listen too. I liked it. The narration was good and kept you entertained. The author did a good job with the characters and plot. I have read all the books in this series and enjoyed them as well. I really look forward to reading more books from this author. I was given this free review copy audiobook at my request and have voluntarily left this review. I am in love with this series! This narrator does a great job with this series! I love the accents and even the even robotic tone of Pax. I wIould have liked to have seen more growth or healing with Pax but the story is great just the same. I recommend that if you want to read this series that you start with book one. The rebel group asked Nahleene Veila’ana to get information on the cyborgs research when Pax received an alert from a brother cyborg that he saw get turned to particles. She discovered some frightening information. She is also compromised when it is dis overed that she used her mental powers to get inside the research facility. Pax hasn't felt anything since he was turned into a cyborg. When Nahleene links her mind to his he can feel emotions through her. Pax also does something stupid in order to try to save people from the newly created cyborgs.